EvolutionWriters.com is an online writing service with a website that addresses the products and services it offers. There is no information regarding how many years this company has been in business. In order to provide consumers with an objective EvolutionWriters review, we have thoroughly studied each page of the website, reviewed several sample writing products on that site, read Evolution Writers testimonials published on its site, and reviewed comments and feedback found elsewhere on the web. In addition, we ordered and took receipt of an undergraduate level research paper, so that product quality could be determined. Evolution Writers does offer a comprehensive range of academic writing services, high school through graduate and professional level programs. Products include essays, term and research papers, case studies, research projects, book/movie reviews, annotations, lab reports, homework/coursework assignments, multiple choice tests, theses, and dissertations. It does advertise that it can produce and deliver papers in 3 hours. The company also produces admissions and scholarship essays, as well as resumes and business writing. Students may also submit their own written pieces for proofreading and editing. In order to establish our Evolutions Writers rating in areas of quality, we reviewed sample products available on the website. We also ordered and received a research paper at the college level and evaluated it for research authenticity, composition, and specified format. As well, we reviewed EvolutionWriters customer reviews both on-site and elsewhere. We reviewed a sample research paper titled, “How has Media Coverage of the Bali Nine Changed Between 2000-2015?” The grammar and composition was certainly appropriate. However, the entire piece did not discuss the Bali Nine, other than in the introduction. The remainder of the paper addressed how media coverage in general has changed with the growth of Internet news coverage. The other concern we have is that while this was research paper sample, there were no citations within the text nor was there a bibliography. We also reviewed two sample essays which were appropriately constructed and did address the topic of the title. Our ordered paper did have authentic resources and was adequately organized, but did contain some grammatical errors. We were unable to find any information about the degrees, qualifications, or employment process relative to the company’s writers, other than them being described as “World Class.” It is difficult to know if there is a full staff of qualified writers able to assume all of the products offered at the academic levels advertised. Given our investigation, we can certainly state that EvolutionWriters is not a scam. 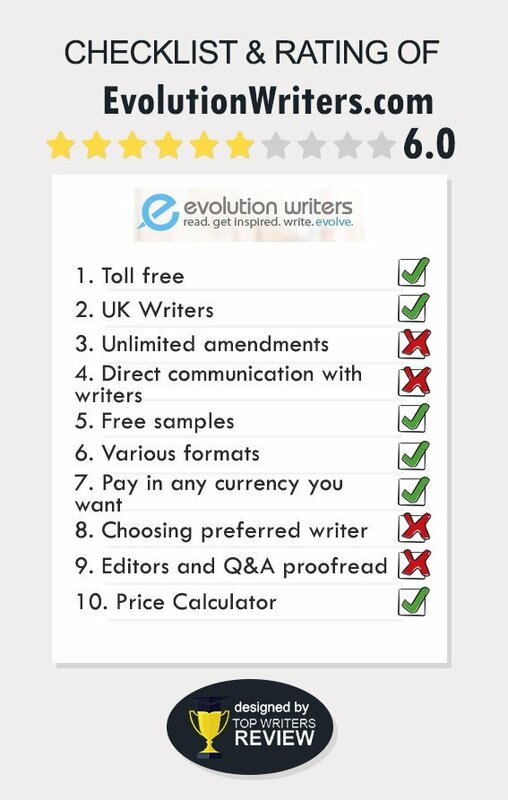 EvolutionWriters.com prices are among the lowest in the industry. A high school essay, for example, begins at $9.97 a page and increases up to $19 a page for graduate level writing. We find this a bit astonishing, although these prices are for a long deadline timeframe. Surprisingly, an admissions essay is priced at $41.00 per page – the highest price of any offered writing. Students may choose among three levels of writing for additional fees, as well as receive a plagiarism report, the fee for which begins at $10 and increases based upon the number of pages. An abstract for a written paper is an additional $15. In terms of EvolutionWriters discounts, we were unable to find any new customer discount on the site. However, there is a 5% discount once a total of $500 has been spent and a 10% discount once $1000 worth of orders have been placed. There were no EvolutionWriters.com coupon codes found on the site either. We also checked the site’s Facebook page to see if there were any special pricing offers available. We did find a contest for a 15% discount. By sharing the Facebook post, a visitor would be eligible for a “drawing” for the discount. Perusal of the Facebook page revealed no Evolution Writers Promo Codes either. Payment methods are by all major credit cards, and the payment process is through a secure third-party. We found that typical extra benefits are offered to customers, specifically a title page, bibliography, and revisions. The company advertises a free plagiarism scan but actually charges for this on as an extra on the ordering page. In terms of EvolutionWriters pros and cons, we would state the following: The company is legitimate and offers a full range of products and services. We do have minor concerns about writing quality, qualifications of writers, and the fact that pricing is so low. Usually, prices this low indicate less qualified writers. EvolutionWriters BBB membership is a definite plus and indicates that there have been no major complaints registered. Overall, our rating of EvolutionWriters.com is Fair. I ordered a couple of times here but won't any more. Their writing is rather simplistic but I use a writing help for minor tasks that I find too boring so that's fine. However it seems like they use a some kind of template from post to post which is annoying. I placed an order here after having received a recommendation from my friend who had won their contest on facebook. I didn't win anything, as usual, but the paper came out OK. Nothing super-duper, just an essay that meets all the basic requirements to style and formatting. I think I'll get a B. What is wrong with you? 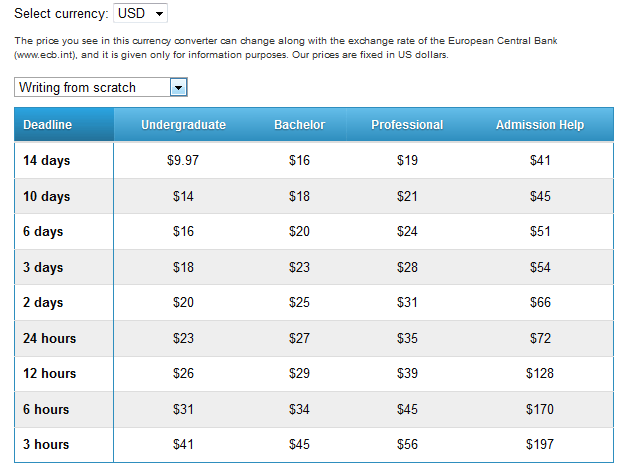 Can't you provide the students with good papers for such a price? I don't expect to find mistakes in the papers I order from a professional writing service! I'd say if you really want a good-quality paper for a minimal price, you need to do your research. EvolutionWriters look good but they charge rather high for powerpoint presentations. Also, I wouldn't order senior-level papers from them like dissertation etc.